I think it expresses what it is we, as artists, attempt to do when we are being authentic with our artmaking, whether it be music, dance, mixed-media, quilting, or poetry. I know that there is a little bit of who I am in everything I create. So what are some of the characteristics of meraki-filled art? What we paint, write, or compose reflects us, because what we express artistically says something. We can paint a rose planted in a garden, or in a vase on a table, or in the hand of a young girl. And that rose, by any other name, can mean many different things, depending on how we express it. In other words, we cannot just paint a rose without also saying something about that rose through our art. And what we say ultimately reflects us in some way. 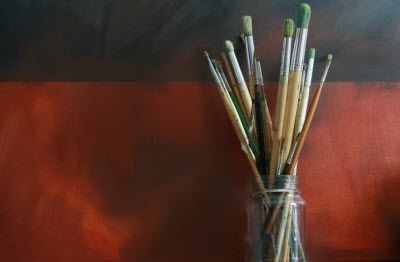 How we paint, write, or compose also reflects us. The modern architecture of Michael Graves is still quite distinct from that of the equally modern Frank Lloyd Wright. A rock ballad by the band Journey sounds very different from a rock ballad by Coldplay. Indeed, part of the maturation of our craft as artists is the defining of a style that makes us unique, and it can be argued that the development of our uniqueness is as important as the mastery of our craft. Unfortunately, it’s really hard to create a unique style. For example, note the prolificacy of “tribute bands” whose sole goal is to sound as close to a particular artist as possible. There’s also a musical sameness to the explosion of worship songs currently being released. And there’s actually a published formula for screenwriters—that spells key elements of a script right down to the page number—that has been very widely adopted by Hollywood, and this summer’s blockbusters attest to the success of this formula. It becomes increasingly difficult to find success in a world that rewards sameness. Our degree of artistry also reflects us. When our art is expressed with a high degree of technique and skill and thoughtfulness, when our mastery of our craft pours through us, it mirrors our Artist God. For God is glorified in excellence, and reflected in transcendence. I’ve discussed the theology of excellence much in this blog and in my book, and I encourage you to check out the link for more info or just read about the Old Testament character, Bezalel, in Exodus 31 and 36-39. Why we paint, write, or compose also reflects us. You’re hungry and you look in the fridge. Fueled by your hunger pangs, you can find a few ingredients, toss them in a skillet, and sit down for a quick meal. Or, like Ratatouille, you can begin a culinary journey that takes you to unexplored territory that satisfies not only your body but your soul. If we are driven beyond the utilitarian by our soul passions, who we are will inescapably be in our work. How, what, and why artists do what we do reflects “something of yourself” in your art. At least it ought to. And meraki can be expressed through message, style, craftsmanship, and motivation. Meraki. I’m going to start using this word a lot. Posted in art, Blog, faith, Imagine ThatTagged art, faith, worshipBookmark the permalink. I read this having my morning tea and it was soulful and inspiring. Each day we learn something new – thank you.